A storm cloud hangs over The Nonpareil office. 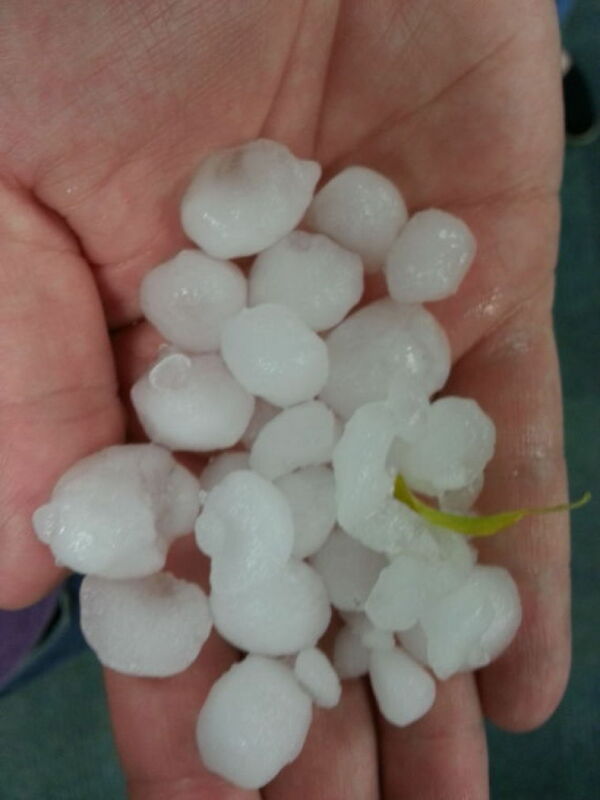 This collection of hail was found outside The Nonpareil more than an hour after the first round of it battered Council Bluffs. Severe weather in Council Bluffs and southwest Iowa has left approximately 9,100 MidAmerican Energy customers without power with a peak of more than 10,000, caused flash flooding throughout the area and more. Western Pottawattamie County is under a flash flood warning until 11:30 p.m., and Pottawattamie and Harrison counties are under a severe thunderstorm warning until 6:45 p.m. Drivers are advised to not drive through high water. • Widespread street flooding in the west end in Council Bluffs. 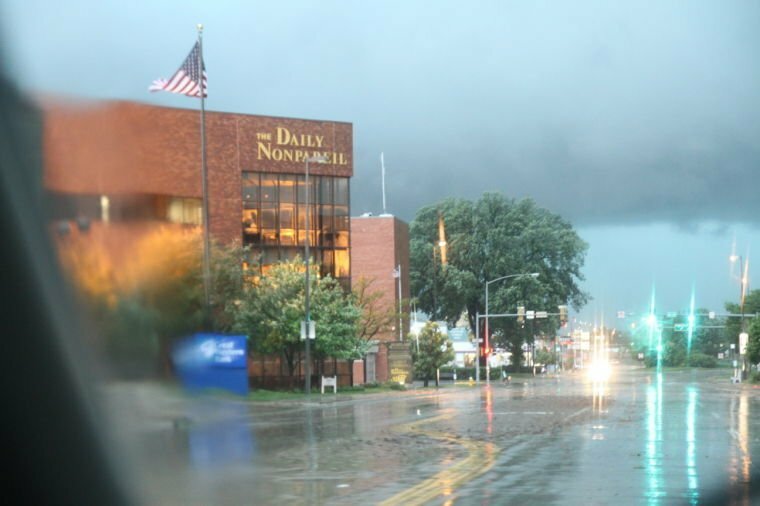 • A woman called from the flooded main level of the Alegent Creighton Health Mercy Hospital parking garage, reporting she was trapped in her sport-utility vehicle, with her child inside. When a reporter arrived, however, nobody was there. • A van was submerged near the Juvenile Detention Center near the South Expressway in Council Bluffs, with an officer saying a man inside appeared to be OK.
• An officer reported seeing cars with floodwaters over the hood at 10th Street and Avenue G.
• The National Weather Service of Omaha reported flooding around 16th Street and Avenue O. • Power poles snapped and knocked over into the road near Railroad Highway (Highway 191) and County Road L34. • Report of a multi-vehicle crash on Interstate 29. • Report of a house fire at 18th Street and Fourth Avenue. • Power lines down in the 300 block of North First Street. • Report of a siding and roofs ripped off houses and motels in Missouri Valley. • Bricks on the roadway from between the 100 Block and Alegent Creighton Health Mercy Hospital.